In version 3.x of this module, the concept of Suggestion Types does not litterally exists anymore. Indeed, suggestions are now populated though a URL callback. The module embeds a Views style plugin to generate such a suggestion callback using Views module. In this documentation, we will consider you to have the Views module activated. We will consider the following use case: we considere having a vocabulary called "Node tags" with many taxonomy terms related. We would like to create a suggestion view for these terms. 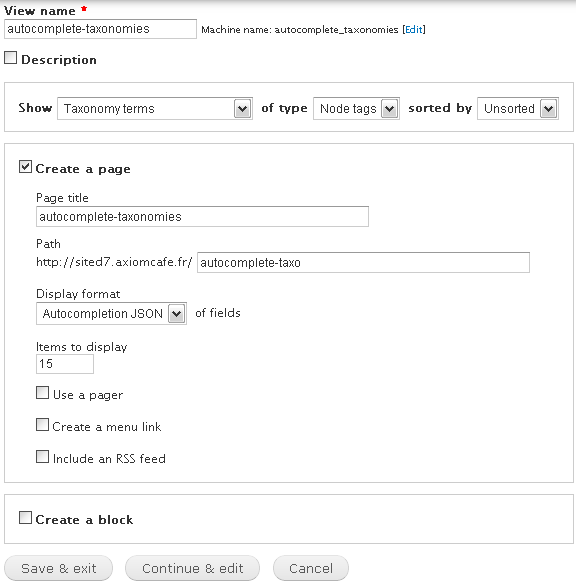 Let's create a suggestion view accessible at the URL callback: autocomplete-taxo?filter= and suggesting taxonomy terms on a specific vocabulary. Pre-configure the view: If your view is easy to configure, you can use this shortcut. of types: Here : node_tags, this is the vocabulary choosen for our use case. Create a page: Make sure the default option "Create a page" is checked. Items to display: Choose the maximum number of items to retrieve form the database. This will affect the number of item to display you can configure in your form admin page. Understand that this option is from a view percepective to retrieve things from the database. But you can limit the number to display on the Search Autocomplete admin page. If you choose 15 here, you will be able to display 0 to 15 elements. Choose the number accordingly to your needs. The less you retrieve from the database, the faster it will be. Configure your view: You can know configure your view according to any settings you need. Display the number of comment ? Filter by published node ? Do what you need ! 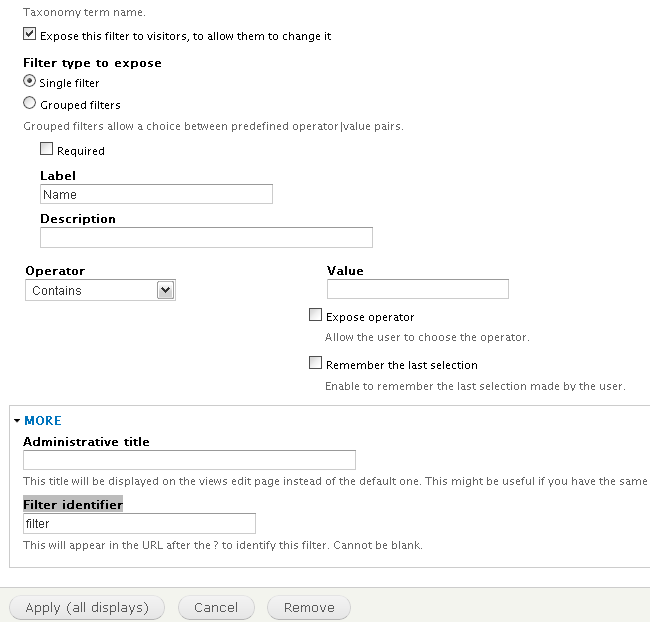 Apply to all display: you should now be redirected to a Configure filter criteron dialog box. Operator: choose the operator "Contains". Change the filter name under the option More/Filter identifier to filter.